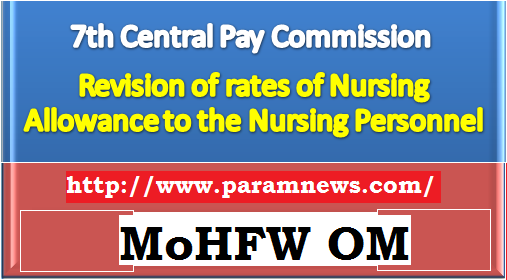 (a) Nursing Allowance will not be treated as a part of pay as already decided vide Ministry of Health and Family Welfare Oder No. Z-28015 /86/97-N dated 28th July, 1998. (b) The additional expenditure due to enhancement of Nursing Allowance would be met by the respective institutions from their sanctioned budget. 2. The revised rates of Nursing Allowance shall be admissible with effect from the 01st of July, 2017. The rates of Nursing Allowance will go up by 25% each time the Dearness Allowance payable on revised pay scale rises by 50%. 3. Nursing Allowance will be payable to all Nurses whether working in Dispensaries or in Hospitals. 4. This issues with the approval of SS&FA vide Dy.No.2897/ 17-IFD dated 10.08.2017 and Department of Expenditure vide ID Note No.300347605/2017 dated 24.08.2017.